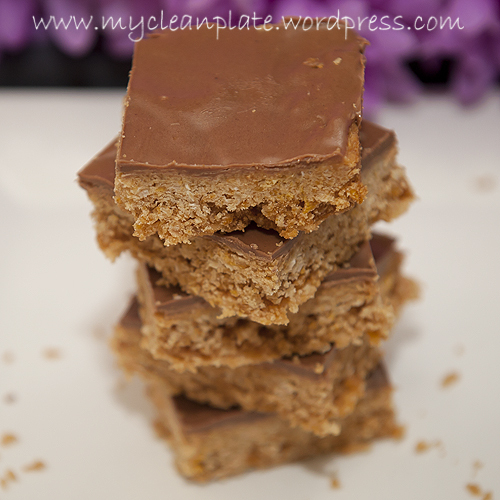 I was busy baking over the weekend, one of the things I made was an oat slice. 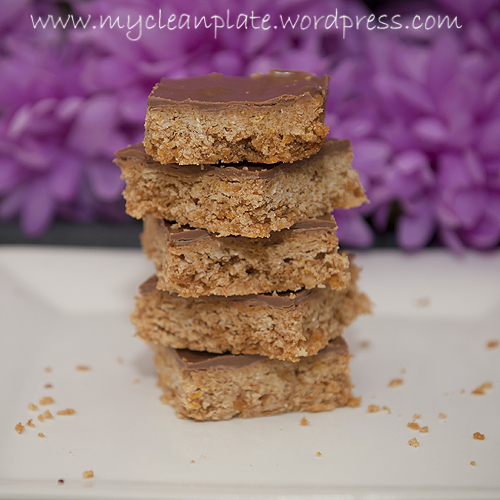 I have seen the oat bars in the supermarket which I full of sugar so I spent the weekend making something nice and healthy the kids could take to school and the kids really enjoyed their sample piece. 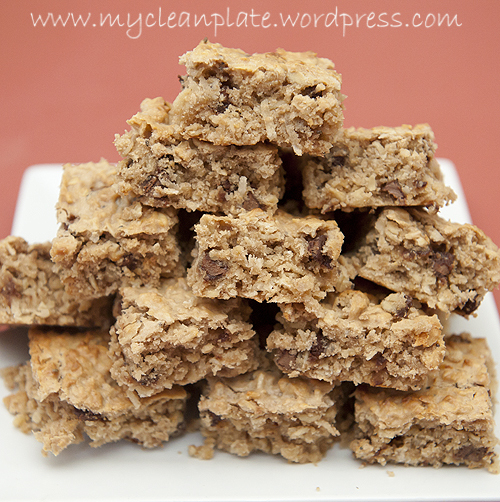 I have frozen individual pieces so its easy for me to grab one and put in their lunch boxes. I wouldnt mind remaking this to make this much more cleaner! 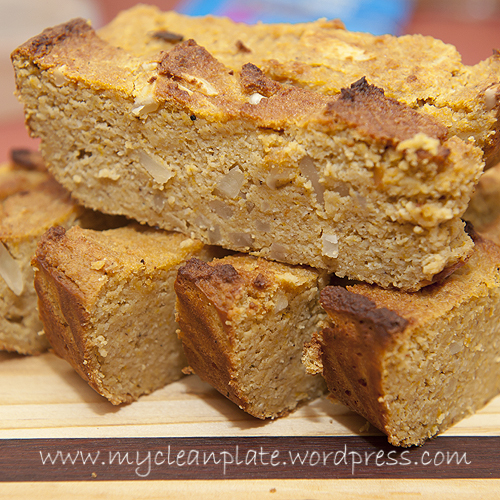 I think it would be pretty easy, using almond flour/meal or coconut flour and coconut oil instead of butter. 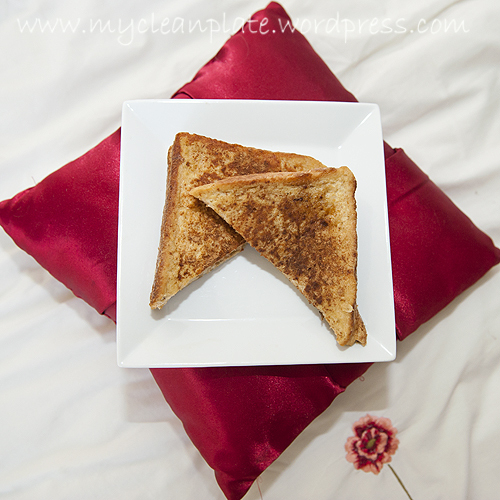 I tried this slice and it really is yummy and full of flavour! You can use regular flour too! It makes around 20 squares, but you can make them a little bigger if you prefer. This is gluten free if you use gluten free oats, they can be hard to find though but heres a Aussie link though to help you find them http://www.glutenfreeoats.com/gloriously-free-uncontaminated-oats/ Or alternatively you can use quinoa flakes or rice flakes. Preheat oven to 180degrees C. Line a slice tray with grease proof paper (approx size 18x28cm I think mine is). In a bowl sift the flours (I find gluten free flours can be a bit lumpy). then add all other dry ingredients. Add the melted butter, vanilla, egg and honey and mashed banana and mix well to combine then stir in your choc chips and sultanas if adding them. 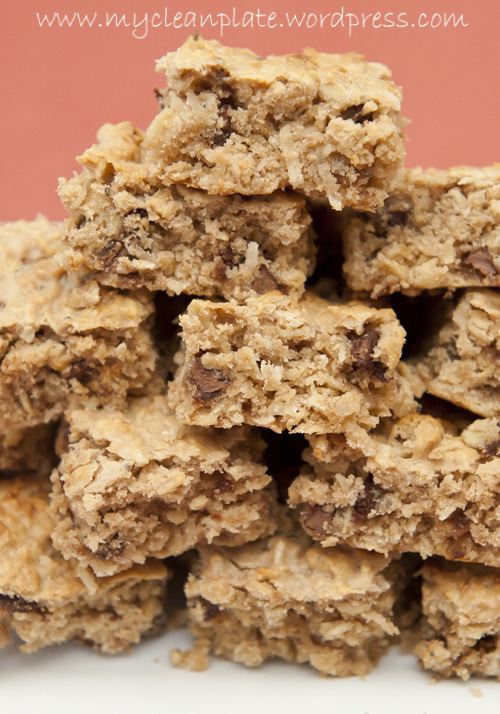 Pour into your prepared slice tin and bake for 20 minutes. Allow to cool before cutting into squares. I had pumpkin to use up so I roasted it, mashed it and was left wondering what I would make. I decided on seeing what pumpkin bread I could create thinking it might be nice for breakfast or just a little snack topped with chobani yoghurt infused with vanilla and cinnamon and covered in berries. YUMMMMMMM! Its just cooled enough for me to cut it and taste test it and OMG!!! Its so yummy. My older 2 who are still awake even got to taste test it and they loved it too!! 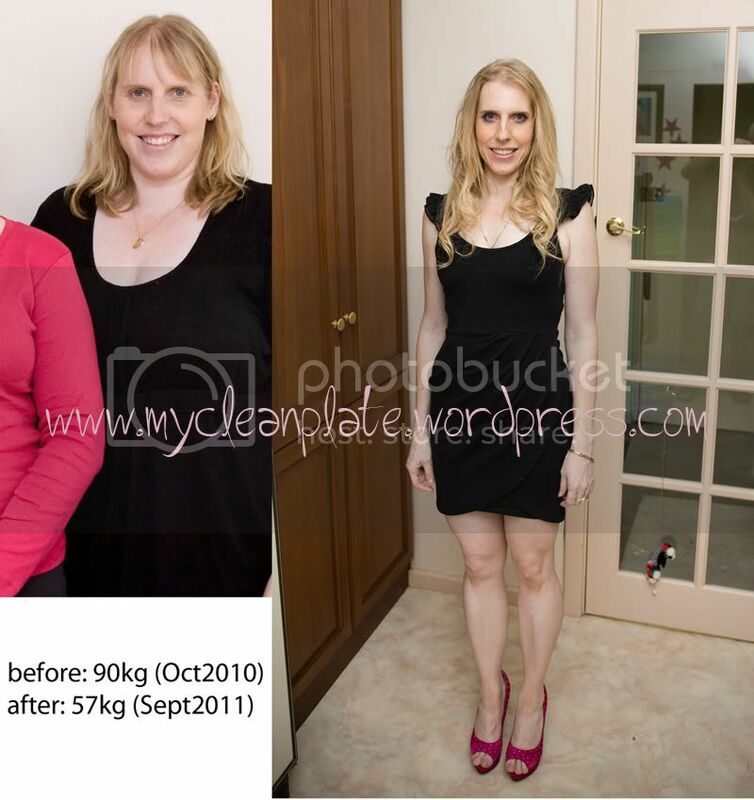 So I will share it with everyone…. Preheat oven to 160 degrees C (fan forced) and line a loaf tin with grease proof paper. 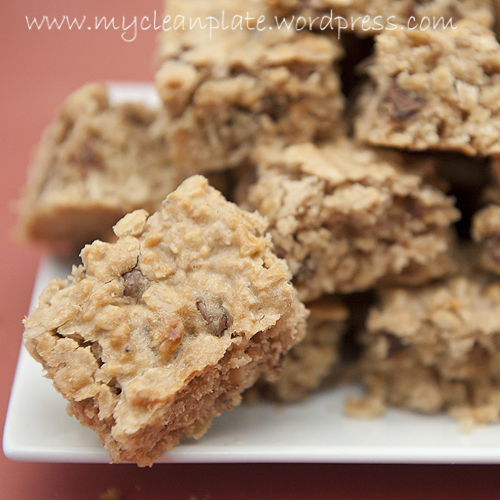 In a food processor blend all ingredients except chopped nuts until smooth mix in nuts. Evenly spread into the prepared loaf tin and bake for approx 50 minutes. Insert a skewer or knife, when it comes out clean its ready. Let cool before cutting into 8 pieces. 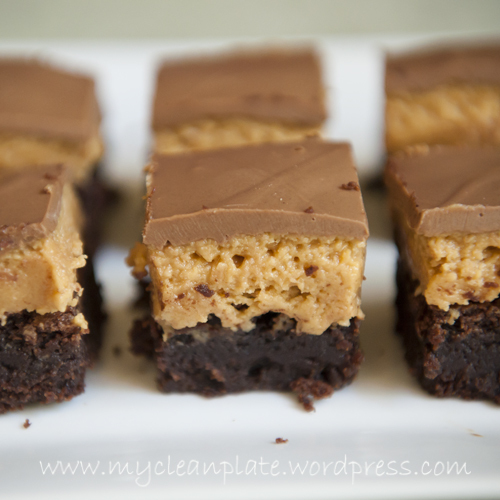 I have seen a few peanut butter brownies floating around the world wide web and thought I’d try to make one thats a little more healthier, more so with little refined sugars. 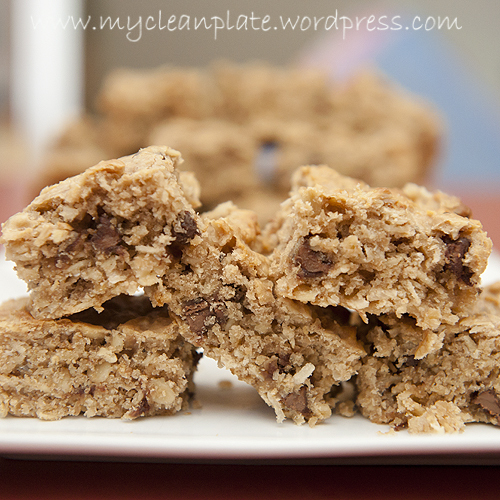 This is not 100% clean but I think, a small square, wont be such a bad treat. I had alittle taste test and wow its amazing….and very rich!!! You dont need much at all. This slice I made for my bestie and her family as we are visiting their new place and I wanted to take afternoon tea. A little treat but try to keep it more on the healthier side if thats at all possible lol. I think, considering they arent a clean eating family, I did pretty well to keep things healthier, less refined sugars and I decided to make this gluten free too!! But ofcourse you can use regular flour. Sadly I ran out of dark chocolate so I had to top mine with milk chocolate but ideally I would have gone for dark chocolate. Preheat oven to 180 degrees C, line an 8×8 inch oven proof dish of baking tray with grease proof paper. In the microwave melt chocolate and butter. Then Whisk in honey, salt, peanut butter, vanilla and quickly whisk in eggs and egg yolk as the choc mixture will be hot due to melting so you dont want the eggs to scramble. In another bowl sift almond meal, amaranth flour and cocoa. Mix into the wet ingredients until well combined. Pour into prepared dish and bake for 20 minutes. Let cool in dish for a little bit before attempting to lift it out. Then when you can lift, using baking paper, and place on wire rack to cool (I cheated and put mine in the fridge to cool quicker). 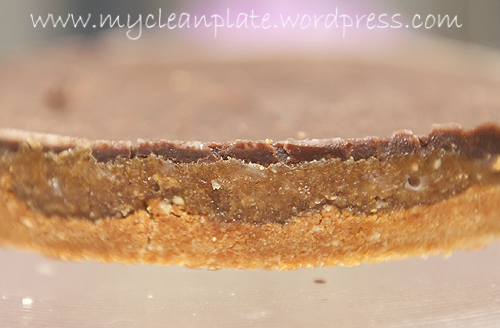 When cool enough spread with peanut butter layer and top with melted chocolate. 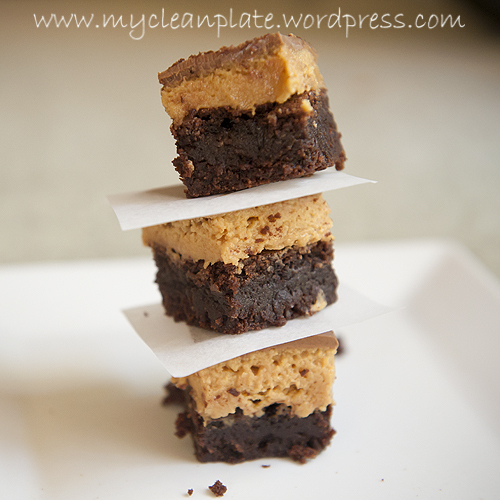 Mix all ingredients together and spread over cooled brownie layer. Place in the fridge for a couple of hours before slicing. Store in the fridge, these are so nice and moist! Enjoy! Big baking day today, one reason was for school lunches and another was for a housewarming afternoon tea treat for my bestie and her family as the kids and I are visiting their new place tomorrow. 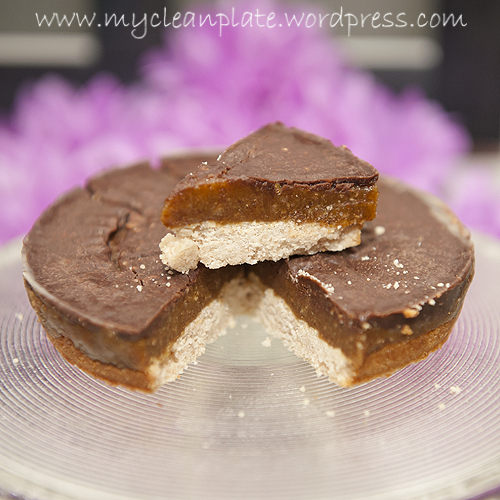 I made 2 slices and came up with a yummy cookie recipe too, a bit of a twist on the classic jam cookie! I had Carlie (8) and Sabrinah (4) helping me in the kitchen today. Freenut butter is basically sunflower seeds ground to a paste and is readily available at many large supermakets like Coles or Woolworths. 1/4 cup freenut butter (sunflowerseed butter) or peanut butter can be used. 1/2 cup melted chocolate (this can be of your choice, milk, 70% or 85% dark depending on your kids taste buds) I would have used dark but was running low and had milk chocolate to use up OR icing/water/cocoa mix option. *Another option but wont be gluten free (unless you specifically buy them online) is swapping 1/4 crushed cornflakes for 1/4 cup rolled oats. This is so easy, it really is. Preheat oven to 180 degrees C, line a half lamington size slice tray (approx 28cm by 18cm) with grease proof paper. Combine all your dry ingredients in a bowl and add your wet ingredients and mix thoroughly. Press into the tray and bake for 15 minutes until golden. Let cool. Top with melted chocolate or chocolate icing. This is a favourite of my 12 year old daughters! I spent the weekend cooking with my youngest, Sabrinah getting ready for the kids first day of school for 2013 which was today! I had one orange left and wondered what I could do with it. So chucked somethings together and made a yummy and healthy kids lunch box snack that is gluten free, dairy free and healthy, suitable for clean eating too!! 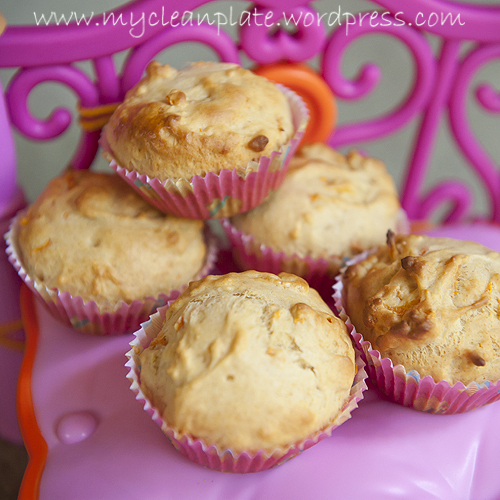 Preheat oven to 180 degrees C and line a muffin tray with patty pans or grease a patty pan tray. In a bowl sift the flour and add the cinnamon. In another bowl combine the oil, eggs, honey, grated carrot, orange rind and juice and vanilla and mix to combine. Mix the wet and dry ingredients together until well combined and spoon 2/3 full in each patty pan. Bake for approx 15-18 minutes (I did slightly smaller ones as my patty pans werent mini but werent normal size and it took 12 minutes so normal size patty pans will be more like 15 or so minutes. Cool on a wire rack, ice if you like with icing sugar and cream cheese with a little left over orange juice or even lemon! Store in an airtight container. You can freeze these for up to about 2 months. This is quite literally a FRUIT cake! And would have to be the healthiest “cake” on the planet!! Made entirely of raw fruit! 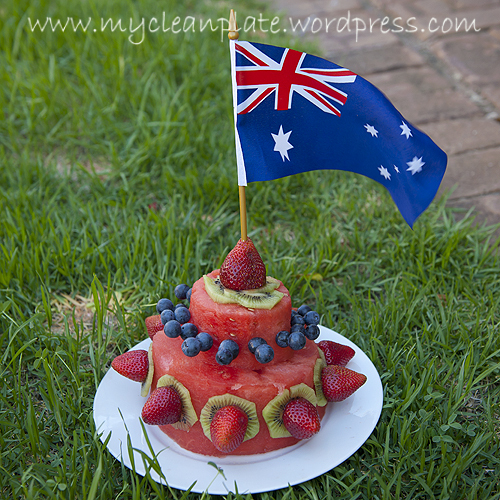 Endless fun again with the kids decorating to make our healthy cake for Australia Day tomorrow. All natural sugars, no fat, low calorie….what more could you want in a cake!! Serve with some chobani 0% fat plain greek yoghurt infused with vanilla and voila, the perfect dessert! 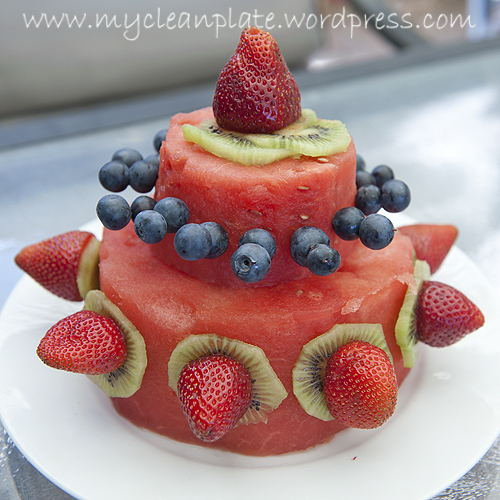 1 whole watermelon cut into 2 thick slices to make the 2 tiers. One bigger, one smaller. To secure the top smaller layer to the bottom stick tooth pics in the top layer and push into the centre of the bottom layer. Then stick tooth picks in and stick fruit on it where ever you want it!! So easy and alot of fun for the kids. This was breakfast the the kids and I thismorning the kids loved it that they made me cook it again for dinner tonight!!!! 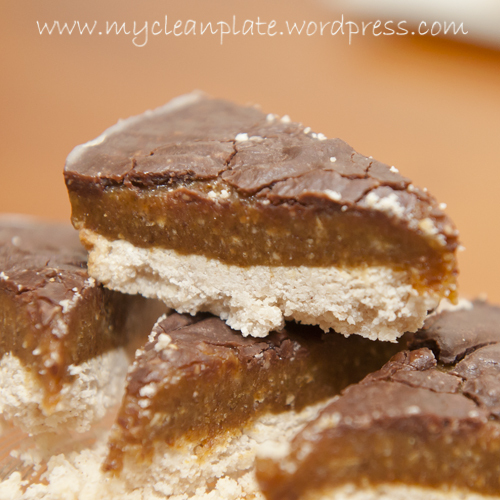 Its so simple and very yummy and really you can have so many different kinds of fillings! 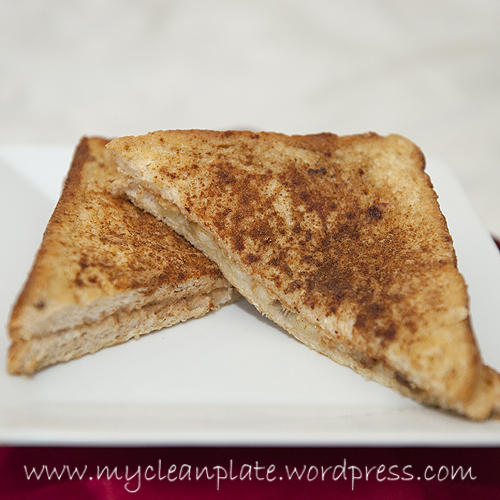 spread peanut butter on both pieces of bread, layer one slice with banana and top with other piece of bread. This is for one sandwich..
Whisk all ingredients in a bowl that fits your size bread. Lay the sandwich in the egg mix until coated and then flip over to coat the other side. 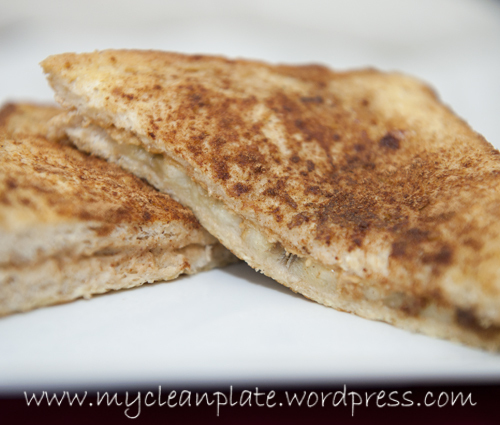 Preheat a fry pan or sandwhich press. Use coconut oil to grease or a little butter if needed. Cook on a medium heat on both sides until golden brown. Sprinkle with extra cinnamon to serve. I eat alot of omlettes for breakfast, usually savoury with chives, baby spinach and fetta, since Mushrooms are a no no on the low FODMAP diet I was trying to think outside the box thismorning how to make my omlette a little different and since I love peanut butter I thought I’d combine the 2. And I’m so glad I tried this as I loved it!!! I found the peanut butter flavour was better as it cooled more. I know what I’m having for breakfast again tomorrow…and the next day and the next day lol. 1 tsp natural peanut butter, extra to serve or chopped peanuts. Mix together beaten egg, peanut butter and baking powder until combined, you wont be able to mix all the peanut butter in but dont worry about that. Preheat fry pan and spray with olive oil spray. Make 4 pancake size omlettes and leave a few minutes until golden and flip. Let cool a little, top with sliced banana, maple syrup and extra peanut butter or chopped peanuts. I really enjoyed this dish, very yummy and refreshing with the yummy cumcumbers. 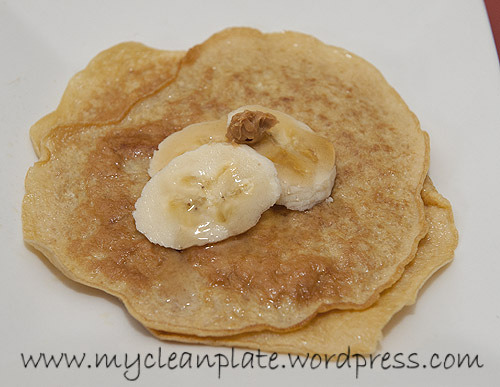 I loved the crunch of the corn tortilla too (can use gluten free flat bread or corn tortilla). Beautiful flavours and will be a regular meal of mine. Perfect for lunch or dinner. 2 skinless chicken breast, diced. Handful of Baby spinach (optional) I used this in mine as i love using baby spinach in salads. Mix the cumin and 1 tablespoon of the rice bran oil in a bowl, add chicken cubes and toss to completely cover chicken. Cover with plastic wrap and let marinade in the fridge for half and hour. Preheat oven to 160 degrees and cut flat bread into bite size pieces (I use a pizza cutter) and spread out on a baking tray lined with baking paper and bake until crisp (5-10 minutes). Place cucumber, tomato, capsicum and chopped herbs in a large bowl and toss to combine. To make the dressing, place all ingredients in a screw top jar and shake well to combine (or mix well in a bowl). Heat remaining rice bran oil in a frying pan over medium heat and add chicken and cook. 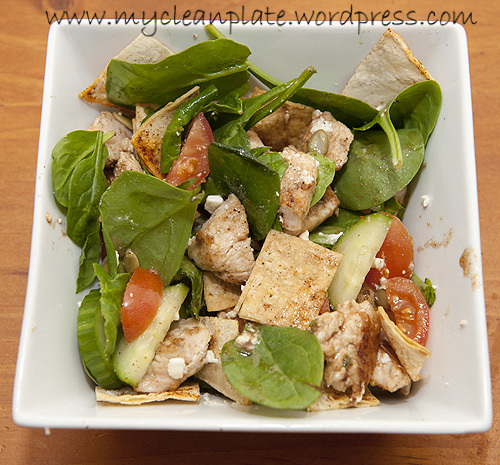 Add the Chicken and dressing to the salad and gently combine, then carefully mix in toasted flat bread. Recipe adapted from: Food intolerance management plan.